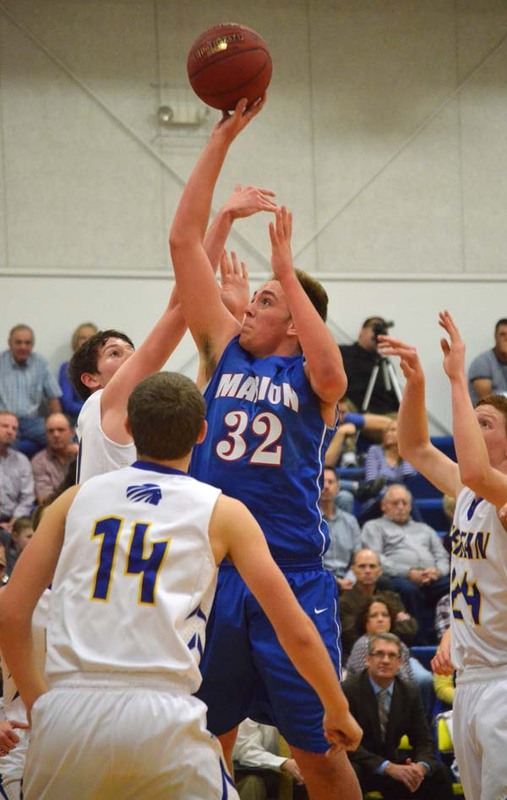 Marion concluded the regular season with a pair of league losses at Berean Academy Tuesday. Girls—Marion struggled to score against Berean’s stifling defense in a 35-20 loss Tuesday. Marion struggled to get looks in the paint and made just two of 13 attempts from the field in the first half (15 percent). Marion turned the ball over 12 times in the first half. However, the visiting Warriors did limit Berean to 15 first-half points on 7-for-15 shooting (47 percent) and turned them over 10 times. The pace of the game slowed from the start, as Berean made the game’s first basket two minutes in, then Kourtney Hansen tied the game at 2 with a basket about three minutes later. That was Marion’s only basket in the quarter, and Berean scored twice in the final 1:09 to lead, 6-2, at the first break. 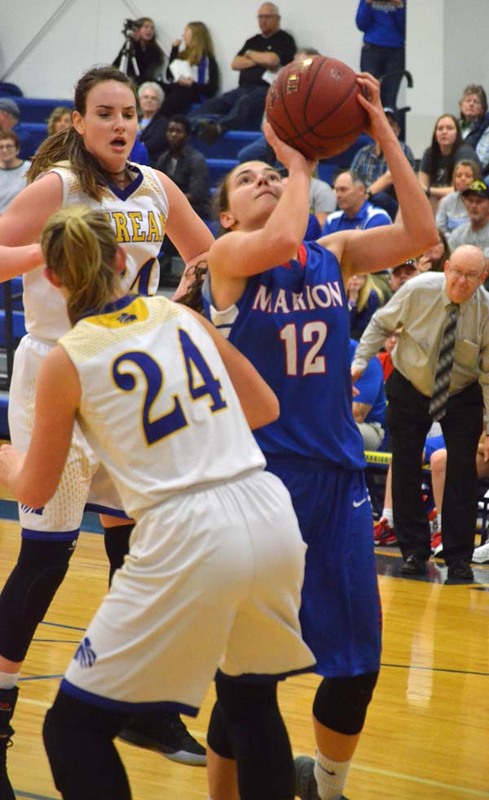 After Berean scored twice more, Marion scored all three of its second-quarter points in a 25-second span, thanks to a free-throw by Hansen and a basket by Marissa Jacobson at the 4:27 mark. Lizzi Landis scored the final five points of the quarter. Landis drained a three-pointer with 3:41 to go, giving Berean a 15-5 lead, and neither team scored again before halftime. Berean built a 19-5 lead after the break before Taelyn Pagel broke Marion’s 6:35-long scoring drought with a three-pointer. Jessi Lewman scored four of Marion’s final six points of the quarter, bringing the score to 21-14 in favor of Berean at the final break. Berean turned the ball over on four of its first five possessions, but Marion couldn’t capitalize, missing the first five shots attempted and making one free-throw. Sam Richmond scored Marion’s first basket of the quarter with 2:16 left in the game, and in the end, Berean earned the 15-point victory. Three Warriors scored four points: Hansen, Lewman and Alli Molleker. Boys—Despite falling behind at the start, Marion trimmed what had been as much as a 15-point deficit to six early in the third quarter, but Berean ran away with the game at the end to the tune of a 61-37 score. A 2-2 tie two minutes in turned into a 10-2 Warrior deficit when Marion shots refused to fall and Berean hit a pair of three-pointers in 28 seconds. Chase Stringer made Marion’s second basket in 10 attempts at the 2:40 mark, and Stringer scored again with 1:08 left in the period. The teams traded baskets to end the quarter, and Berean scored at the buzzer to take an 18-8 lead at the first break. Marion outscored Berean, 14-13 in the second quarter. After Berean built its lead to 29-14, Mason Pedersen scored baskets at the beginning and end of an 8-0 Warrior run that brought Marion within 29-22 with 26 seconds left in the half. Berean scored the half’s final basket to take a 31-22 lead at intermission. Marion trimmed its deficit to six, 33-27, when Pedersen hit a three-pointer at the 5:28 mark, but made just three more baskets in 12 attempts the remainder of the game. Berean, meanwhile, outscored Marion, 11-5, in the final 5:13 of the third quarter to lead, 44-32, heading into the fourth period. The home team continued what it began, outscoring Marion, 17-5, in the final period to win by 24 in the end. Stringer led the Warrior scoring effort with 11 points. Coming—Marion will compete in the Class 3A sub-state hosted by Mission Valley next week. Teams in the field in addition to the host school and the Warriors are: Council Grove, Southeast of Saline, Osage City, West Franklin, Central Heights and Wellsville. Brackets will be released Wednesday. Follow hillsborofreepress.com for updates.